Why Midtown and Wall Street developed both separately and parallel to each other. But a recent study by Jason Barr and Troy Tassier in Journal of Regional Science proposes a different explanation: Midtown attracted a specific cluster of businesses and occupations that saw promise in its growth as a high-end shopping district. Based on a detailed analysis of business directories, the study examines the specific types of economic activity that relocated from downtown to Midtown during the mid-19th and early-20th centuries. The study tracks the location of Manhattan skyscrapers greater than 100 meters in height built from 1890 to 2010. The gap between the two distinct clusters in Wall Street and Midtown invites theories, but the economics of skyscrapers explains a clearer reason for the two sub-centers: the clustering of talent. 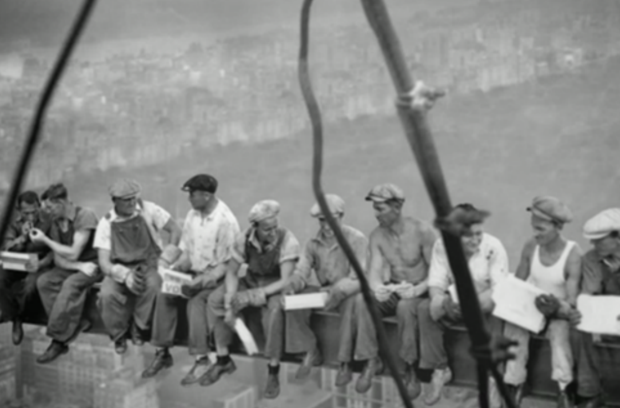 What spurred the construction of skyscrapers was actually the evolving locations of the places white-collar business and professional workers lived and worked during the late-19th and early-20th centuries. As white collar workers moved uptown, some businesses moved closer to them, in Midtown, while specific industries, such as finance, stayed downtown. Midtown’s growth significantly lagged the uptown shift in talent, suggesting that working closer to home was not the sole factor for office placement. And the financial industry particularly remained firmly anchored downtown, even as large numbers of its employees moved farther uptown. It wasn’t about bedrock either. That theory suggests that the deeper bedrock in areas just north of the existing financial district made it more expensive to build skyscrapers there. But the study finds that any additional costs related to drilling would have been offset by the much cheaper land prices in this area of the city. Instead, these areas were filled with factories and working-class tenement districts, which made them less attractive as a business location. Nor can Midtown’s growth be pinned entirely to the opening of Grand Central Station. Businesses started moving to Midtown years before the station opened, and the new cluster had developed its own dynamic well before Grand Central became a commuting hub in the early 20th century. The fastest pattern of residency shifts and subsequent workplace moves occurred from 1861 to 1892, well before the station’s construction in 1903. Instead, Midtown’s growth was spurred by the relocation of specific types of businesses and economic activity. The first businesses to move to Midtown were architectural firms, who followed the construction boom uptown. The entertainment industry then consolidated around Broadway theaters and Times Square. Newspapers followed thereafter. Midtown grew from these initial moves. Once a number of firms broke off from the downtown office clusters, the new Midtown area developed a dynamic of its own. Finance remained downtown because of the intensity and power of its existing cluster. This was also the reason for the geographic gap between the downtown and Midtown businesses districts—the area in between was filled with those factories and working class districts. This proximity of factories and working class areas to the city’s high-end retail district was also of course a prime factor in the introduction of zoning and land use restrictions around the same time. Midtown’s emergence as a major shopping agglomeration accelerated its development as a location for offices. In the end, it was amenities, not talent or cost, that split New York into two separate and distinct economic centers. What ultimately drove the move to Midtown, according to the study, was the area’s earlier emergence as a high-end shopping center. High-end retail shops began moving farther uptown in the late 19th and early 20th centuries to avoid proximity to the noxious garment factories and working-class neighborhoods that were encroaching on their previous locations.